The Vice Chancellor of Nasarawa State University, Keffi (NSUK), Professor Muhammad Mainoma, has stated that the white paper of the visitation panel on NEEDS assessment has since been released and some aspects of the document are currently being implemented. Responding to an enquiry from NSUK CampusWatch via text message concerning the planned strike action by the Academic Staff Union of Universities (ASUU), the Vice Chancellor said that the part of the white paper that is yet to be implemented is “the aspect that requires the approval of the Governing Council, of which a committee has been inaugurated by Council to advice it”. Mainoma revealed that the white paper had been released since 2014, even before the constitution of the present Governing Council. He said since the inauguration of the advisory committee, it has been working day and night to submit its report so that implementation will commence. Hear him: “I believe the committee is working hard to submit a report to the council”. On the unpaid-earned allowance, the Vice Chancellor said that 30 percent of the total sum has already been paid; adding that what is hampering the full payment is the dwindling revenue accruing to the university. “Management has demonstrated willingness by settling 30 percent of the earned allowance within a short time. These arrears accumulated over a period of four years but the cash flow problem is the only hindrance to full implementation”, said Mainoma. He appealed to ASUU to shelve the planned industrial action and exercise a little patience, promising that his administration is doing its best to ensure that their welfare is taken care of. 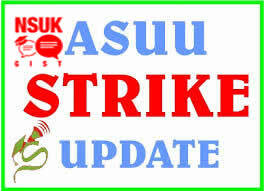 NSUK CampusWatch reported that NSUK chapter of ASUU has concluded plans, awaiting the nod from the National Executive Committee (NEC) of ASUU, to proceed on an indefinite strike because of the refusal of the Nasarawa State government and the university management to implement the agreement reached with the union. The chairman of the union Dr. Theophilous Lagi in a telephone interview on Saturday told NSUK CampusWatch that both the university management and Nasarawa state government have failed to abide by the agreement entered with the body, living them with no choice but to shut down every academic activity in the institution if something is not done to avert it. Apart from a backlog of unpaid earned allowance, the chairman revealed that the government is yet to release the white paper of a visitation panel to the university on NEEDS assessment. “Earned allowance is part of it but it is not just the main issue. There are other issues are very fundamental. You remember the last time there was a visitation panel to the university, they came, they did their work, there was a recommendation and a white paper, but up till now the white paper has not been released. And if the white paper is released it will go a long way in addressing the rot in the system”, Lagi said. Meanwhile, NSUK CampusWatch will soon bring you the reaction of the state government as effort is already afloat to contact the state commissioner for education.